I was given some attention by the press for climbing trees. Here’s how that happened: Rather than to gloat over a bit of press I’m telling you how it happened and how you might get some for your world changing project. During my year of climbing, I wasn’t seeking the media, but I did follow up opportunities. It wasn’t until crowd funding a few years later that I began actively seeking their attention which is a pain in the arse. I recommend reading George Monbiot’s insightful Activist’s Guide to Exploiting the Media. I wish I had. The media like action and spectacle. During the project my first interest arose from a random meeting with Sally Churchward, who is a journalist committed to Green issues. I visited a Transition Towns meeting in Southampton and Sally was there. Somehow we got chatting and we met for an interview in a cafe. I appeared in the Southampton Daily Echo and her article was quite positive. Local news wants quirky local stories. Easy. Good imagery is essential. This is one the press loved. Taken by my good friend Jacob Parish in Chiavarri, Italy. In Norway I met someone around a kitchen table and told them about it. Her niece worked in NRK radio (equivalent in Norway of the BBC), and she told her daughter about the project. Her daughter then got in touch and climbed a tree with me, recording our conversation there. I did my best to give her potent sound bites but in the end the piece was pretty bit lame – novelty news for Norwegian truck drivers. Our agendas were very different. It wasn’t the revolutionary speech to challenge the Norwegian people that I had in mind. I just about got away with it and partly thanks to the presenter Hilde Hummelvold; I think she had a soft spot for my environmental agenda and made it as easy as possible for me. Honestly, I was metaphorically shitting myself regurgitating the stuff we’d spoken about before the show; my confused body was high on adrenaline created on behalf of my ego trying to protect itself. A seed contains the complete message needed for exponential self-replication of itself when it’s in partnership with the right environment. It takes skill and confidence to narrow down what needs to be said into just such a potent package and then deliver it succinctly between the cracks of a listener’s ego. If the seeds gets through to the soft nutrients below, into a person’s psyche and is allowed to grow its delicate roots, the seed becomes their own and eventually breaks out through the crust of who they once were, changing them from the inside out. In time they begin making their own seeds to scatter for our inspiration. If my seeds died when I delivered my message, I can blame the listener’s ego for being unready to receive them – but mostly I blame mine for being scared to be passionate and confident. There were other radio interviews and another piece for local TV news – I was the novelty. One of them came about because my dad was on a train and happened to meet an editor for the news who he vaguely knew from around Lillehammer (it’s a small town). He told him about my exploits. This was how I ended up being put into a tree by the fire brigade who had nothing better to do than practice their skills. 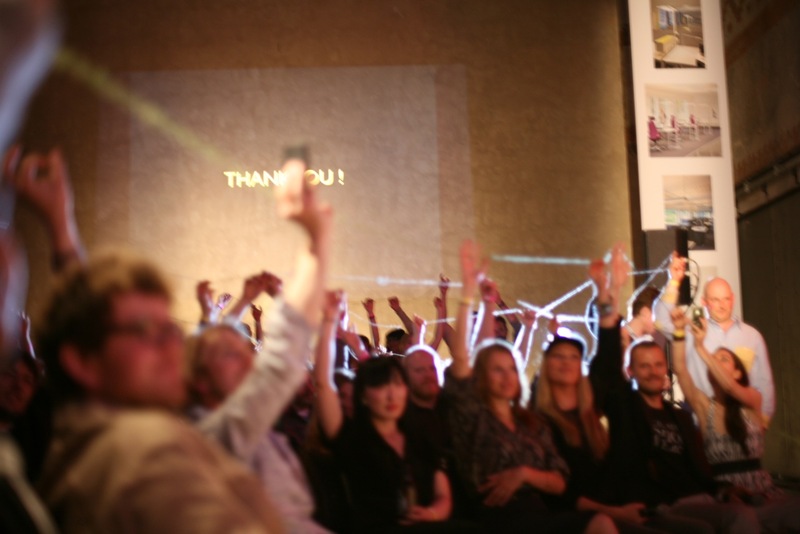 I wrote to Pecha Kucha, Oslo about my project and was offered a slot in their program, scheduled just days before the project ended in May 2011. I offered to perform a ceremony after my talk. 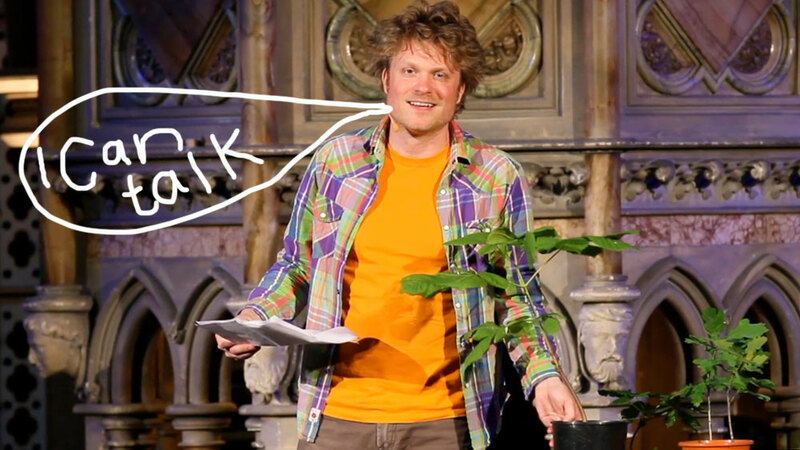 It involved lots of string for the audience of 500 to get tangled up in while I recited poetry about being interdependent; relating the string to arbuscular mycorrhizal fungi that lives in symbiosis and connects the forest – allowing the sharing of nutrients between our ‘finger-roots’. I wasn’t trying to gain media attention here – I just wanted to do it. The point is, the energy and added value you give to something may not produce media exposure but will increase the chances. Obvious really. During the crowd funding campaign I began tweeting and posting to the blog (most of which I’ve now deleted because it’s well out of date). I was then lucky enough to be contacted by Amy Finlayson, who works in PR and wanted to help the project in her spare time. (She has a soft spot for trees). Professionals in PR have journalist contacts and access to journalist databases, so there’s a reason people employ them. Amy wrote a press release for me. I’d been hassling Sally Churchward via email (the journalist who wrote the first story about Art of Climbing Trees), to do a follow up piece. She finally agreed to write something but needed more info. I sent her Amy’s press release, and the press release was more or less what appeared in the paper with Sally adding her own touches to it. This got the attention of another PR agency who contacted me wanting to promote the project. They did another press release and it was picked up by national newspapers. This was when it appeared in London’s Metro newspaper, which was seen by the DJ Steve Lamaque on BBC Radio 1. The piece inspired songs with ‘tree’ in the lyrics for his ‘National Anthem’ music game. When the Daily Mail printed the story, it was picked up by news agencies in China and Cambodia. Who knew Asia reads that garbage. I was invited to appear on radio and Geobeats news made a short film about it. I was asked to guest write a piece for a forest protection interest group, Save Our Woods, which I spent quite some time writing. I also created a special ‘London trees’ press pack for the Londonist, and they did quite a nice job of it. It helped that I had a promotion (asking people to draw a tree for the book) that readers could click through to my website for. Local interest is obviously worth considering as a starting point – I was from Southampton, and Southampton like to write about their locals. It’s also worth contacting people who have the same interest as you, and asking them to write something about it – in my case it’s protecting the environment. I’ve no idea of the impact in relation to how much time I spent on it and this equation is often unknown. You never know which little piece will spark the next one and eventually give you the audience you’re looking for. Despite all this attention – very little focus was brought to the crowd funding campaign. There was almost no mention of my crowd fund by most of this media. You have to accept the media have an agenda and manage them and your expectations as best you can. Be lean and precise in what you want to get across. Don’t forget to mention your website etc several times during interviews – specially radio interviews, so it’s harder for them to edit it out. Persevere with hassling people politely. Create a press release or ask for help with it. The press don’t have time and want easy to package content. Have striking well taken images ready to send out. Be ready to jump out of bed and put your performance hat on. (In the case of the Fire Brigade TV spot in Norway – that’s exactly what happened). If you have something interesting to say in an interesting way – the press will want to write about it. They need content. Our perception of life is a bubble of psychosis and the media amplify versions of reality with distorted reflections and refracted stories. That’s all. It’s more important than ever to pierce that bubble and let fresh air in.